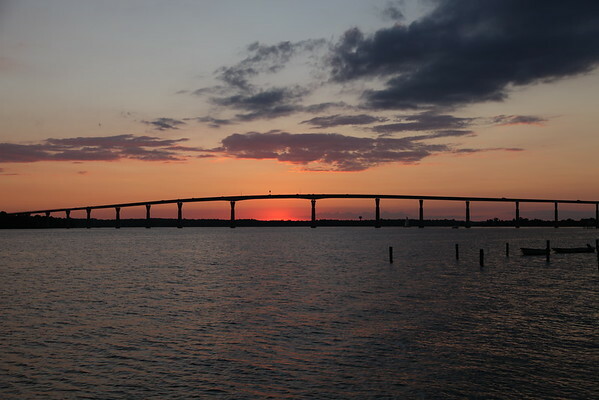 The Governor Thomas Johnson Bridge (also referred to as the Thomas Johnson Bridge and the Solomons Bridge) is a 1.5-mile bridge in Maryland over the lower Patuxent River joining Calvert and St. Mary’s counties. The bridge, named for the first governor of Maryland, Thomas Johnson, was built in 1977, and officially opened in January 1978. The bridge, carrying two lanes and no shoulders, rises to a height of approximately 135 feet tall, making a trip over the bridge in windy weather somewhat nerve-wracking for travelers. From the top of the bridge, one can see the entire town of Solomons, the runways at the Patuxent River Naval Air Station, and the Chesapeake Bay.